Germany is one of the best European countries that offer tremendous job opportunities to the ambitious crowd because of a significant shortage of skilled labor among its citizens. Among all of the European countries, Germany has the most to offer as far as work in the fields of Science, Engineering, and Technology are concerned. Additionally, most German companies pay generously, and the work-life balance is given a lot of importance. By working in the country, you can be assured a high-quality living, safety, and a no-stress visa process. This is the most common type of visa issued to work in Germany. It requires a confirmed job offer from a German company and is valid until the end of the duration mentioned in the employee's contract. The minimum salary/offer for 2019 is 53,600 euros. This scheme falls under EU Blue Card system, you need to have recognized degree. This type of visa is specifically for individuals with specialized skills in Technology, Mathematics, IT, natural sciences. The EU Blue Card conditions still apply but minimum salary required is 41,808 euros for 2019. If you have a German degree or equivalent recognized degree from other country then you may be eligible to enter and stay in Germany for six months to find a job. During your search you cannot work and you should have funds to support yourself. 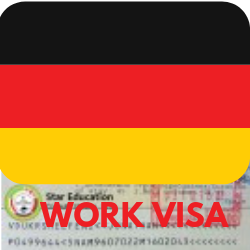 This type of visa is issued to individuals who want to set up their own business in Germany. However, this type of work permit may be hard to qualify for as the individual needs to display that he has excellent business plans and the potential to succeed. This type of visa is issued to individuals who are being transferred from their company to the German branch. This type of work visa is specifically issued to individuals who have been hired as "live-in nannies" by a Germany-based family. This visa is valid for 12 months, but the individual must possess strong German language skills to qualify. Passport (with a validity of minimum 6 months). 2 recent photographs with a light background. Demand Draft for the visa application fees addressed to "Consulate General of the Federal Republic of Germany, ( the City of Consulate, example: NY)." Mark-sheets, certificates, and other relevant supplementary documents. Document was asserting a clean criminal record. Minimum of 2 photocopies of the above-mentioned documents. Declaration of credibility of the submitted documents. The visa application form is available on the website of the German Federal Foreign Embassy. Once the job offer has been received the visa application form must be completed. The application must be filled twice as the German Embassy requires two original copies of the application form itself. Two passport size photographs must be submitted along with the application forms. To this package, the remaining required documents must be included. This complete package must be submitted in person at a German Consulate in your country of residence. The visa processing time will take anywhere around 6-11 weeks and costs approximately around 60 Euros. A labor market needs test required if the employer is applying for the work permit. Otherwise, it is not needed. Work permits are generally issued for 1-2 years and then may be renewed again. After a period of 4-5 years, the employee becomes eligible to apply for permanent residence. Once arriving in Germany, the individual must go to the local Registration Office to register themselves and validate the work visa. 50,000 - 60,000 work permits are issued every year for the country. To ensure a smooth and comfortable visa process, early applications are encouraged.